Privacy is your right to control how information about you is used, processed, stored, or shared. If you ever go online, internet privacy should be one of your biggest concerns. Surf the web and you cant help but stumble on a new story about how much your personal data is collected while you enjoy your favorite sites. Think youve got nothing to hide? Think again. There are two common privacy myths. Some people believe they dont really need their data, so theres no reason to protect it. Others think their data is safe and protected enough, so why bother worrying? - Whether you realize it or not, youre responsible for posting a lot of your own private data. - Websites you browse daily may potentially sell your data to third parties. - Many companies neglect to secure their users data. This results in massive data breaches exposing your personal records all over the web. - Some ads go beyond advertising goods and track your browsing habits. It gets worse. Armed with this data, advertising companies may influence your purchasing, voting, and life-changing decisions. A recent Equifax case shows just how bad it can get. There are three ways your private information can be exposed: by online ads, by websites that track your online behavior, or by massive data breaches. Let's take a closer look at each one. Youd be surprised how much power these advertisements have over your purchasing habits. By knowing your browsing habits, advertisers can push you to shop till you drop. Theres nothing free in life, including your favorite email and social services like Gmail, Twitter, and Facebook. Remember, if youre not paying for the product, then most likely you are the product. This means you dont pay for using the service with money, but rather with your data, which might not be intended for sharing with anyone. And we barely scratched the surface. The amount of data stored for every single online user is shockingly vast. For example, Trumps campaign used thousands of data points on every American. It appears that a number of internet services fail to implement basic security measures for their databases. 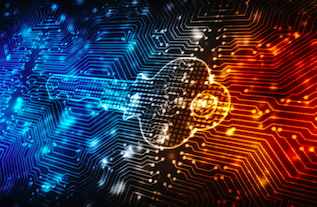 Even more, suffering from data breaches has become a trend for large companies, which leads to leaking thousands of gigabytes of user data online. Its time you take your privacy seriously. Be careful with your online behavior and improve your computer security. The rule of thumb is to think before you post anything on the web. This isnt about being paranoid about every action online (it might be helpful, though), but more about common sense. Always remember where your personal data may end up and think twice whether you want to expose that piece of information. - Never post photos of your passport, plane tickets, driver license, or credit card details online. - Avoid clicking ads you see on the web. - Be careful when opening emails or messages from unknown senders. - Keep away from spam emails. There are several ways to cut down the amount of information collected about you on the web.The main three things you should focus on are your browser, your operating system, and the online services you use. While youre searching for things online, your browser is keeping notes. This includes all your search queries (including those you didnt search for, but wrote in the search bar), the websites you visited, your IP address, your physical location, and your online identity. Want to expose less personal info? Follow this quick browser protection guide. a. Enable warnings when visiting fraudulent websites. b. Check the Block pop-up windows box. a. Enable Prevent cross-site tracking. b. Select Ask websites to not track me. c. Block all cookies (note it might affect some website functionality or log you out). b. Deny accessing your location when visiting websites. 4) Autofill tab (make sure everything is disabled). 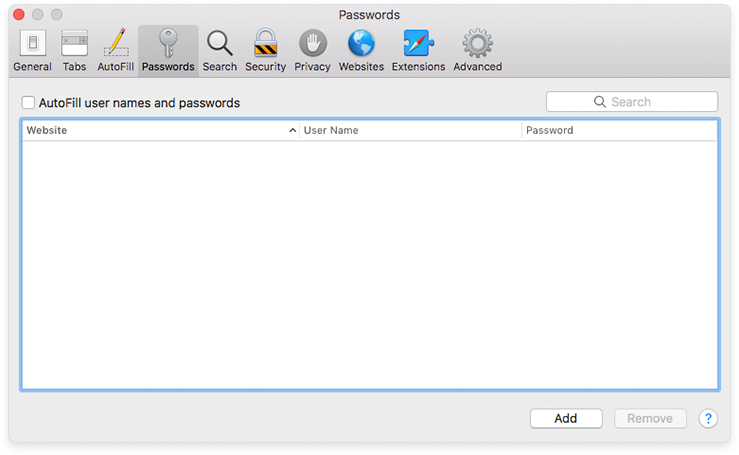 5) Passwords tab (make sure AutoFill is unchecked, and remove any listed websites). 1) Turn off prediction services and sending information to Google. - Block running Flash player. Flash appears to be the source of high severity security bugs and its going to stop receiving updates in 2020. - Block popups and intrusive ads. 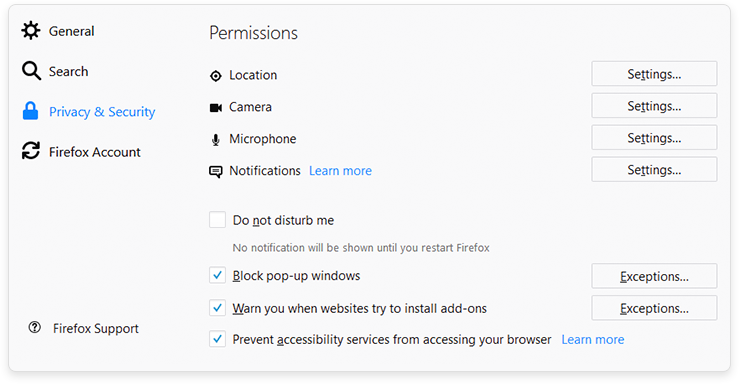 - If you dont use audio/video chats in your browser like Google Hangouts etc., you can turn off Camera and Microphone access. 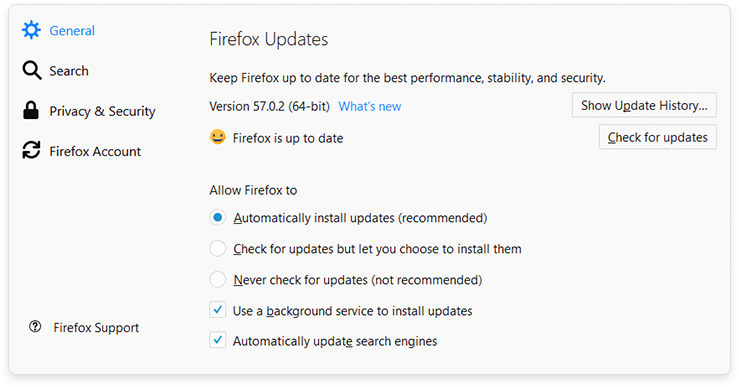 1) Update your Firefox automatically. 2) Uncheck Accept cookies from websites and disable third-party cookies. 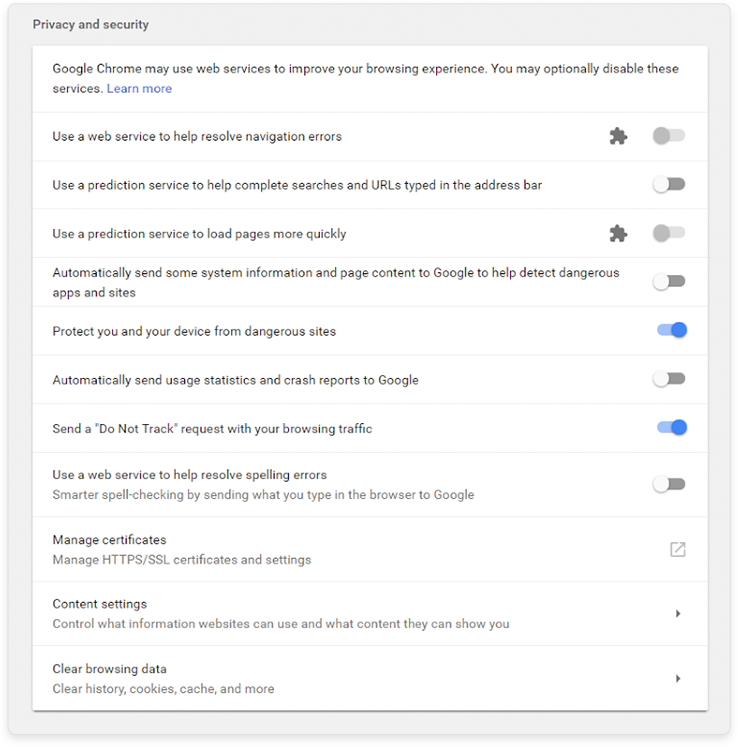 3) Select Always to enable tracking protection. 4) Manage your permissions and warnings. 5) Uncheck storing your passwords. Instead, consider a reliable, secure password manager like 1Password, LastPass or KeePass. Here are some useful extensions that will help you reveal much less personal records. 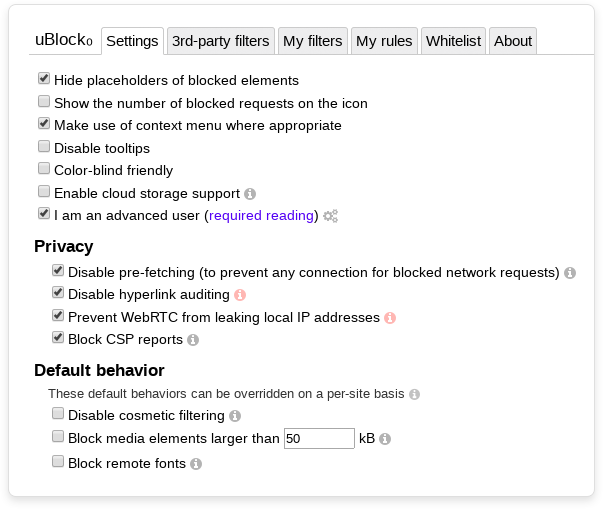 - uBlock Origin blocks online ads and website trackers. - Privacy Badger disables spying ads and invisible trackers. - HTTPS Everywhere helps encrypt your connection with websites you browse. There is no silver bullet for disabling web tracking, but following the basic steps above (or at least installing the easy-to-use uBlock Origin, which is available for all major browsers) will help you share less private data online. Lets walk through some popular operating systems. According to popular opinion from the most tech-savvy users, while Windows 10 is shiny, new, and easy to use, its a bad choice from a privacy perspective. Although you cant completely stop Windows from collecting your data, you can minimize it. To do so, turn off every privacy, telemetry, advertisement, tracking, feedback, account information, and location setting. macOS is no privacy advocates dream-come-true either. The OS sends Apple all kinds of info like your location, Spotlight searches, Siri conversations, and iCloud backups. But it is much easier to disable tracking in macOS than in Windows. Connecting to the internet through VPN provides an additional privacy layer. It also hides your IP address, so even if someone tracks your activities, they wont be able to find your location. 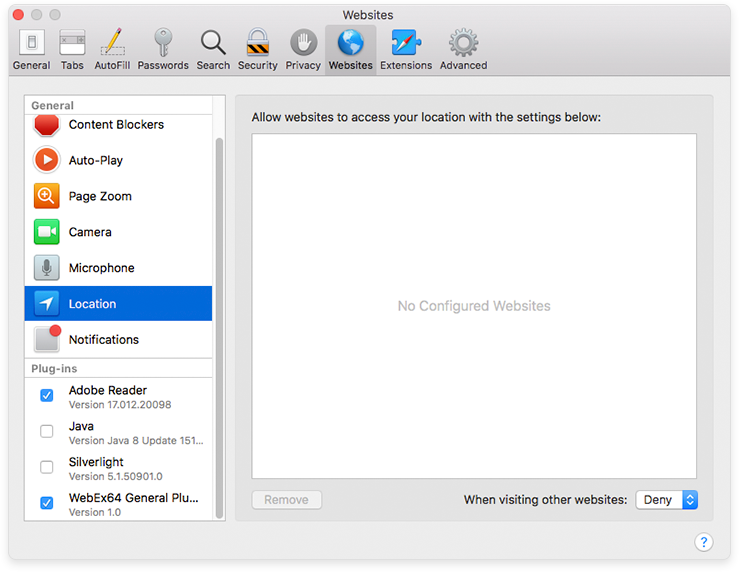 Use VPN when you browse the web from public spots, like libraries or coffee shops. Its a good habit to fend off an attacker from doing nasty things to your computer. But be wary of free VPN services. They may collect logs of your online activity. For help making your VPN decision, check out this great independent comparison of various VPN providers and choose VPN wisely. - Other websites you visit if you use social media widgets such as Like us on Facebook or Retweet. - Everything you do on a website if you sign up using your social media, Google or Github account. But lets face it. Some of those “free” services are extremely valuable, for both work and pleasure. If you need them, consider switching to free open source alternatives that wont track your activity. For example, you can migrate your mailbox from Gmail to Protonmail and switch your default search engine from Google to DuckDuckGo. You can find some more open source alternatives here. Following the steps above will protect you from mass surveillance on the internet. Just keep in mind that if one of the three-letter agencies wants to target you, managing your browser settings and installing VPN isnt nearly enough. In Europe, a new privacy regulation institution called GDPR was recently established. Its aimed at providing EU residents with full control over their personal data. GDPR requirements apply to every data controller or processor which holds data of the EU residents or those based in the EU. Obviously, it also applies to businesses that hold or process their EU-based clients data. As you see, online privacy concern is a burning issue. Now cybercriminals need less time and efforts to track users, but we hope the tips and tricks in this post will help make sure your private info stays private. The list of free non-tracking services is available here. You can also check a great in-depth overview of privacy-related topics here. Attention - Portions of this article may be used for publication if properly referenced and credit is given to Kromtech Security Center.